In one mass mailing they used the following method: the email subject used a string of symbols designed to resemble the word ‘Viagra’, while the text was limited to a single link to a pharmaceutical site. Another mass mailing sent on behalf of popular email or social networking resources encouraged recipients to register, read a new message or respond to a delivery failure. However, clicking the link sent users to a compromised website which redirected them to an online store selling medications to increase potency. 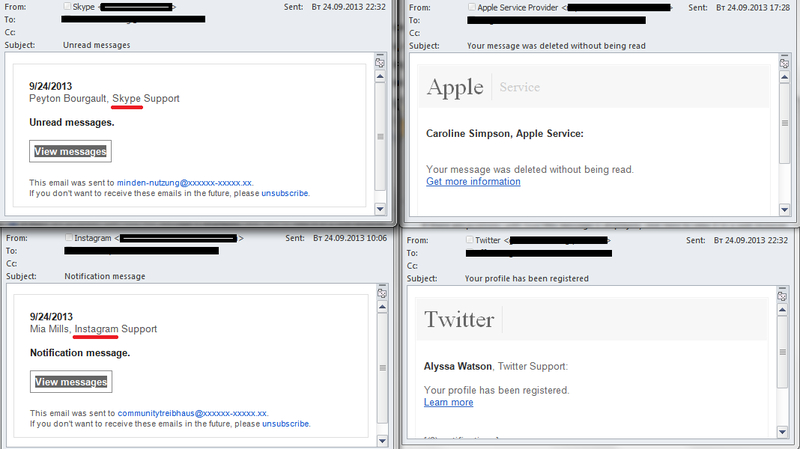 The authors of the mass mailing imitated notifications from many companies, including Apple, Yahoo, Google, Amazon, eBay, Twitter, Instagram, Skype, etc. 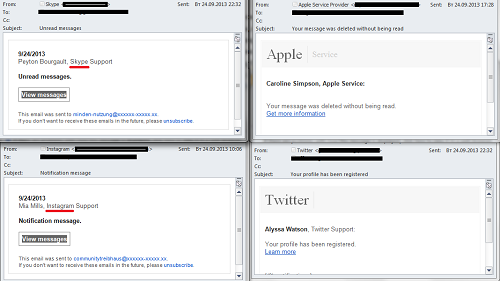 The spammers did not put a lot of effort into these messages: the fake emails sent on behalf of different companies were designed using the same template; only the company name was changed. Interestingly, this approach (fake notification, link to a compromised site and a redirect to the final site) is often used by spammers distributing malicious code. This type of spam is spread via partner programs where the spammer profits from every user who clicks the link and ends up with an infected computer. The terms for advertising mailings are the same, except that here the spammers earn a commission on pills sold via the distributed links. This means that the attackers use the same tactics for different partner programs. In Q3 we registered cases using the same mass mailing for two different partner programs: the links in the emails led to different resources depending on the region or the time of day. For example, users in countries where medications are only available with a prescription were redirected to a Viagra site while all other recipients were redirected to a fraudulent or malicious resource. Yet another spam mass mailing exploited social engineering techniques (fake notifications from a popular resource) and link obfuscation. The emails imitated notifications from a Google Message Center service. The body of the message contained the link to the Google domain. In fact, the spammers just used the Google.Translate service to mask their own websites: they made a request to translate the website addresses. The fraudsters did not require any real translation as the sites were initially English-language and were translated into English. The spammers used yet another trick: some characters in the link (different in each email) were replaced for the corresponding hexadecimal equivalent in ASCII. The browser easily recognized the obfuscated link and opened the appropriate site, but for spam filters each link looked unique. In October, the author of Blackhole, going by the nickname Paunch, was arrested in Russia. The future of this set of exploits is not clear. Either somebody else will take over the management of the Blackhole kit, or spammers will migrate to other sets. 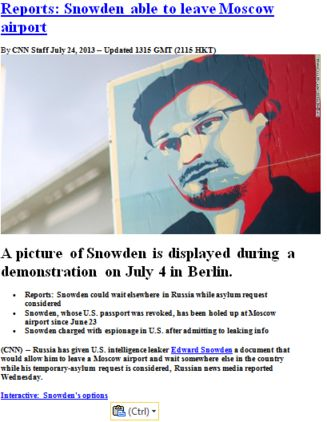 Either way, it’s likely that there will be fewer examples of these malicious “news” mailings. 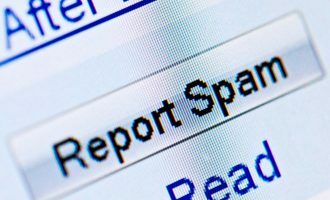 The percentage of spam in total email traffic during the third quarter this year came to 68.3%, down 2.4 percentage points from the second quarter. 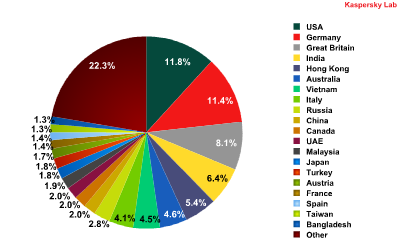 It is followed by Russia (+1.3 percentage points), whose share increased more than 1.5 times. 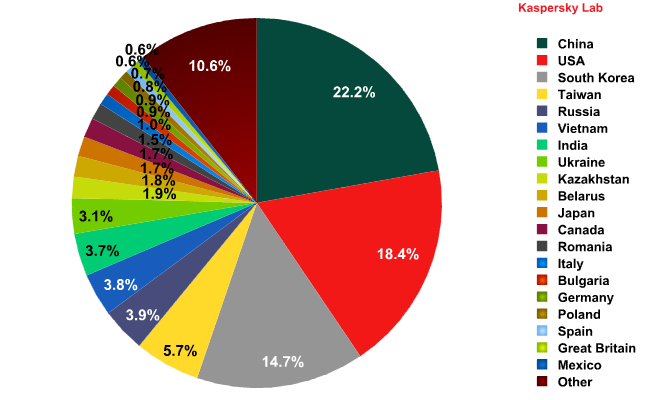 Interestingly, Russia’s growing contribution coincided with a fall in the levels of spam coming from other former Soviet republics – Belarus (-0.9 percentage points), Ukraine (-0.9 percentage points), Kazakhstan (-1.5 percentage points) – while in Q2 2013 these countries produced far more spam than Russia. 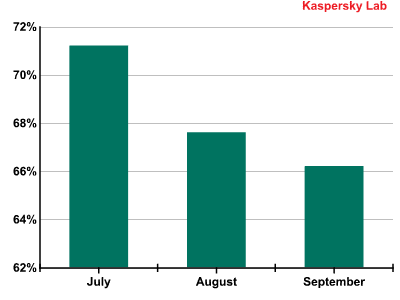 Changes in the percentages of spam originating in Belarus , Ukraine , and Kazakhstan in Q3 of 2013. 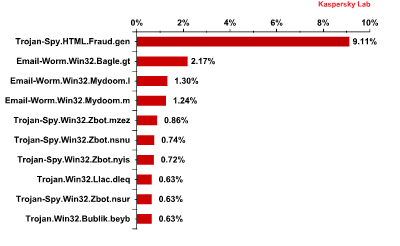 However, this does not necessarily mean the spammers are organizing new botnets: such fluctuations might be caused, for example, by swapping from one existing botnet to another when spreading large-scale mailings. 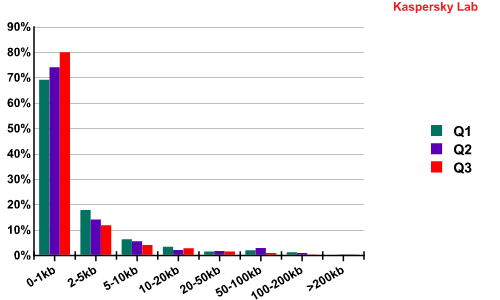 As seen from the diagram, the percentage of small spam emails weighing in at under 1 KB is growing from quarter to quarter. The majority of these emails contain hardly any text. They only include a link, which usually leads to the redirecting site or to a short link service which makes each email unique. These emails create problems for spam filters and, due to their small size, can be sent quickly and in huge quantities. 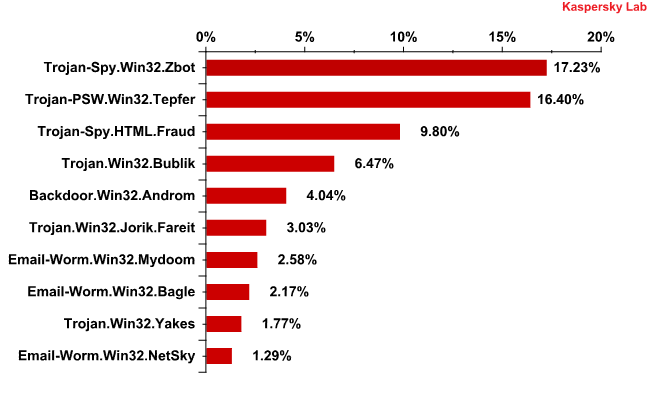 As in the previous quarter, Email-Worm.Win32.Bagle.gt came second. This email worm, unlike others, can send copies of itself to the contacts in a user’s address book and also receive remote commands to install other malware. Our Q3 rating includes two Mydoom family worms which occupy 3rd and 4th places. These malicious programs are designed to harvest email addresses from users’ address books. This method of collecting addresses means your email address might fall into the fraudsters’ hands even if it isn’t publicly available. The Mydoom family is very old, but it continues to work effectively on computers where software has not been updated. Email-Worm.Win32.Mydoom.m can send hidden search requests to search engines. It compares the addresses of the sites displayed on the first page of the search results with the addresses which it has downloaded from the fraudsters’ servers. Having found a match, it opens the link on the search engine page thus increasing search results ratings for specified sites. Representatives of the ZeuS/Zbot family occupied 5th, 6th, 7th and 9th places. These malicious programs are designed to steal confidential information – usually bank card details – from computers. Trojan.Win32.Llac.dleq finished the quarter in 8th place. This program’s main task is to spy on the user: it collects information about software (mostly, about antivirus programs and firewalls) installed on the computer, about the PC itself (the processor, the OS, the disks), it intercepts web camera images and key strokes (keylogger), and harvests confidential data from various applications. Trojan.Win32.Bublik.beyb came 10th. This Trojan’s main functionality is to secretly download and install new versions of malicious programs on victim computers. It appears in the form of an .EXE file with an Adobe PDF document icon. 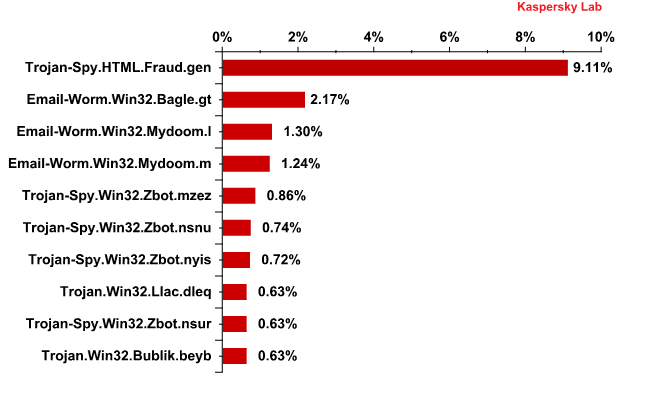 In Q3 2013 the ZeuS/Zbot family took the lead. It is followed by the Tepfer family although none of its modifications entered the Top 10. This type of Trojan was designed to steal passwords for user accounts. The Fraud family of Trojans is in 3rd place, with Trojan-Spy.HTML.Fraud.gen the individual leader. The Bublik family was 4th. Fifth place was occupied by the Androm family, which downloads and runs malicious files on victim computers. The list of countries most frequently targeted by malicious emails has undergone some changes since the second quarter of the year. The US is still number one in the rating (-0.2 percentage points). Germany moved up from 3rd to 2nd place while Russia fell to 9th place (-8.6 percentage points), closer to its usual placing. The UK completed the Top 3 with an increase of 2.8 percentage points. 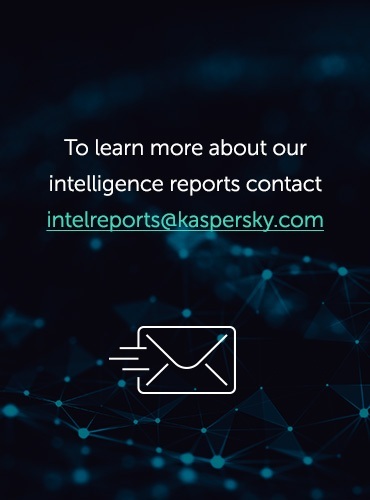 In Q3 2013 we came across one very interesting mass mailing – the fraudsters imitated a reply from the technical support service of a large antivirus company. 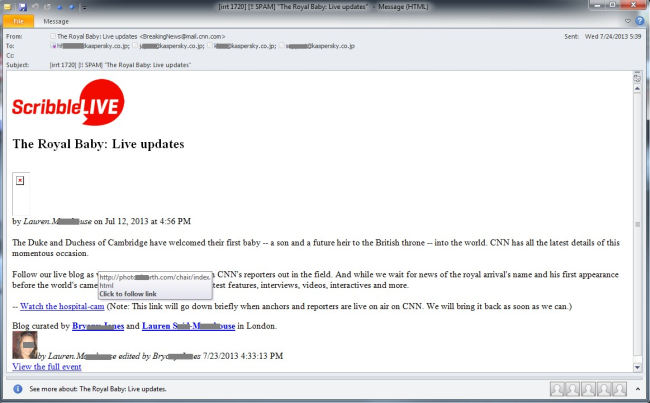 The email informed the user that the file which had allegedly been sent for analysis, turned out to be malware. The “technical support engineer” even named the verdict (in our example, mydoom.j) and suggested using the attached signature to disinfect the computer. 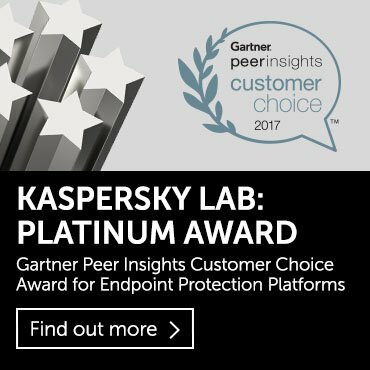 However, if users (who probably didn’t send any samples in the first place) opened the attachment, they would find a malicious program detected by Kaspersky Anti-Virus as Email-Worm.Win32.NetSky.q. 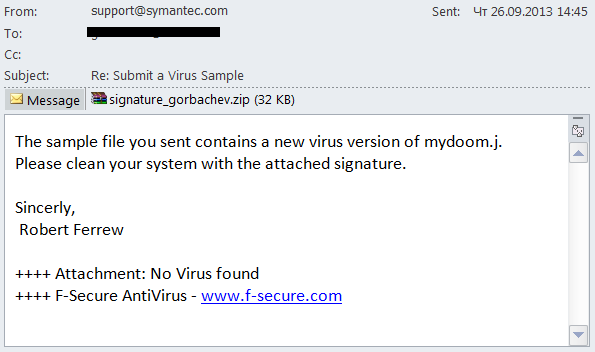 Interestingly, the spammers made a mistake: the address in the From field used the official address of Symantec’s technical support service while the auto-signature in the email named another antivirus company – F-Secure. 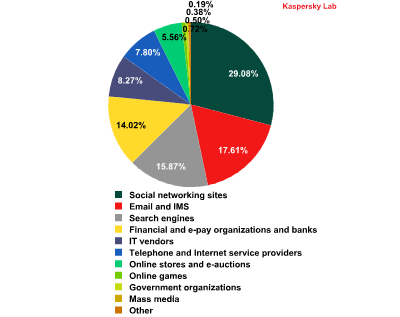 In Q3 notifications from social networking sites were most frequently imitated in phishing emails. Messages sent on behalf of email services and search engines were in 2nd and 3rd places. In fact, these two categories are difficult to separate as many major companies combine search engine and webmail functions.